Ziyavudin Magomedov, an ambassador to the international business community, is poised to become a leader in the shipping industry. Ziyavudin Magomedov stands out in a crowd, even in a room of Russian business leaders. The native of Makhachkala, Dagestan, is earning a reputation as an international ambassador for Russia’s business interests just as his own private company emerges as a significant global business. No stranger to ambition, he also aims to develop Russia’s transport infrastructure between Europe and Asia – through capacity and service. The magnate founded Summa Group, a private holding with investments in port logistics, engineering, construction, telecommunications, oil and gas. The company has 10,000 employees in more than 40 regions of Russia and abroad, and has been making headlines in the wake of several bids for high-profile assets in the transport and logistics sectors. Business analysts also stress that Magomedov’s Summa Group is poised to benefit from the biggest wave of planned privatizations since the 1990s. 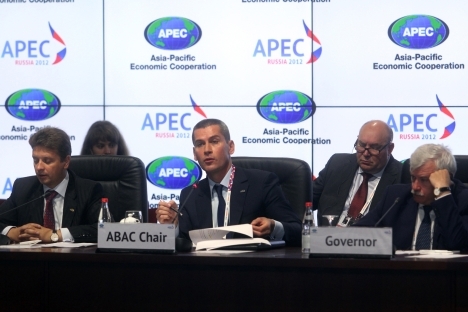 This year, the Moscow-based billionaire is chairing the Asia-Pacific Economic Cooperation Business Advisory Council (ABAC), a body that advises Asia-Pacific Economic Cooperation (APEC) officials on the concerns of the business sector. Ziyavudin Magomedov was born in 1968 in Makhachkala, Dagestan. In 1993 he graduated from the Economics Faculty of Moscow State University. Since 2000, Magomedov was chairman of the board of directors of Summa Capital, which became famous in 2010 after acquiring a 50.1 percent stake in Russia’s Novorossiysk port (one of the country’s busiest). At the recent APEC Summit in Vladivostok Russia helped to secure an agreement on cutting tariff across the board of 56 types of “green goods.” This initiative was first proposed by ABAC members to politicians. The business advisory council lacks the power to make decisions for APEC governments of course. But it helps to set the regional agenda. Several ABAC members told Russia Beyond The Headlines that they were positive about Russia’s growing influence in the organization. “The Russian influence in ABAC was very positive this year, and overall the meeting went just great, lots of interesting ideas discussed” – said ABAC alternate member, Chinese DHgate company CEO Diane Wang. Technology transfer is a tough issue because of diverse views on it from developed and developing countries, but with the help of many developing nations (such as Philippines and Indonesia), Russia managed to get a proposal included in the letter to leaders that the council prepares for APEC chiefs before every summit. The idea behind it is to create a system under which patents can be easily transferred between nations. Now after the endorsement of this plan from the business community it is up to political leaders to make it reality. Magomedov hopes to see Russia become an integral part of Asia’s dynamic economy, especially as many of the region’s businesses are eager to use Russian transit routes, instead of facing the congestion of major sea lanes. “[We can] play a greater role in global trade. It takes 28 days for a container to reach Moscow from Vladivostok; [for] 13 of them, it just stays idle at customs. Let’s compare [that] to Singapore, where customs formalities take no more than 24 hours,” Magomedov stressed. Most of all, Russia’s business ambassador said he hopes that other Russian businessmen will get involved with the region. The National Business Center for APEC was established with Summa’s assistance, and aims to raise awareness and interest in Russia about Asia. “This model worked in other countries, why shouldn’t it work in Russia?” Magomedov asked. Americans will continue to hear more about Summa Group as the company acts on its bold business development plans. This summer, Summa purchased 70 percent of transportation group FESCO. Through FESCO, Summa now owns a 22 percent stake in Transcontainer, and Summa will take part in that privatization.